You couldn’t find better examples of women of power than the female executives on the cover of this issue. Thasunda Brown Duckett, CEO of Chase Auto Finance, leads this JPMorgan Chase unit and enables hundreds of thousands of consumers and small businesses to finance the purchase and leasing of new or used cars. Alicia Boler-Davis, General Motors’ senior vice president, Global Connected Customer Experience and corporate officer, is responsible for providing customers with the best service and experience, playing a critical role in the expansion of sales for one of the world’s largest auto manufacturers–202,786 units in January alone. Teresa L. White, president of Aflac U.S., is part of a management team that effectively manages more than 4,500 people and 74,000 independent sales agents so that the company can grow market share and maintain its position as the nation’s No. 1 supplemental insurance provider. The impressive credentials of these executive women, along with their management prowess and bottom-line responsibilities, have placed them in the upper stratum of major companies and earned them membership into an exclusive club: Black Enterprise’s “50 Most Powerful Women in Corporate America.â€ Review the list and you will find a roster of corporate leaders, many who oversee billion-dollar divisions and thousands of employees. From product and service development to talent management–and much more–these corporate mavens all drive revenues, profits, and innovation at some of the nation’s largest publicly traded companies. Collectively, in industries ranging from pharmaceuticals and financial services to telecommunications and retail, these executives represent a transformative force in global business. Our editorial team developed this list to not only celebrate the black female business elite, but to demonstrate that it requires unparalleled expertise and resilience to break through barriers that female executives continue to face today. According to a 2014 Center for American Progress study, the percentage of women in top management positions and on corporate boards has stalled: Less than 9% of top managers are women, and women of color hold only 11.9% of managerial and professional posts with just 5.3% of African American women in those positions. As for seats on corporate boards, there are only 43 black female corporate directors on the boards of the largest 250 companies of the S&P 500, as shown in our special report on corporate governance in the July/August 2014 issue. Despite this wide gap within the executive suite, the 50 women we identified are among a select group of corporate leaders who continue to shatter the perpetual glass ceiling. -Â These executives manage significant lines of business or serve as representatives on the executive leadership teams of the top 1,000 publicly traded U.S. corporations. Also, they contribute to the development of the business, operational and financial policies and strategies of their companies. -Â These executives are among the highest ranking in their companies; they hold C-suite positions, including chief executive officer, chief financial officer, chief operating officer, chief administrative officer, chief marketing officer, and chief human resources officer with global responsibilities. Others included have president and general manager positions and/or hold executive vice president, group vice president, or senior vice president roles. -Â Executives holding the position of general counsel, chief diversity officer, chief legal officer, chief compliance officer, and chief information officer/chief technology officer within their company were excluded from the list. -Â Executives who solely oversee corporate communications, investor relations, community development, government affairs, or external affairs and public/media outreach were also excluded. -Â This list does not include presidents of corporate foundations, nonprofit organizations, membership associations, philanthropic entities and educational institutions. 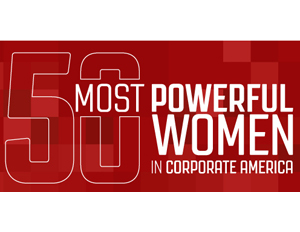 View the 50 Most Powerful Women in Corporate America here.